'The stubborn once who are yet to believe. The quiet notice is no joke. 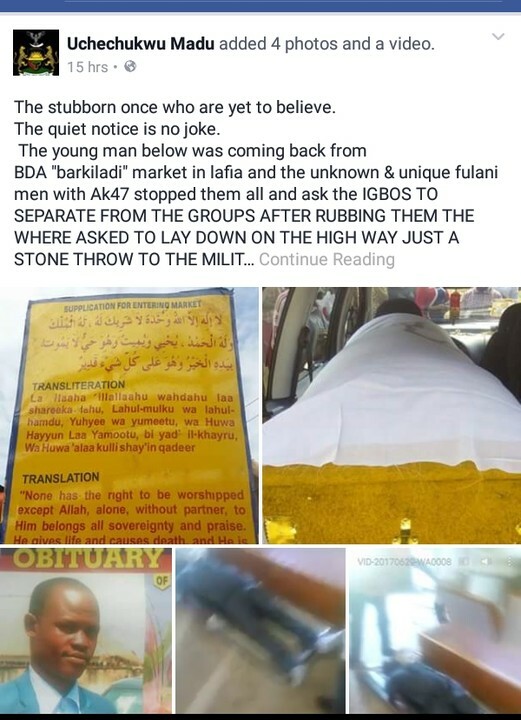 BDA 'barkiladi' market in lafia and the unknown & unique fulani men with Ak47 stopped them all and ask the IGBOS TO SEPARATE FROM THE GROUPS AFTER RUBBING THEM THE WHERE ASKED TO LAY DOWN ON THE HIGH WAY JUST A STONE THROW TO THE MILITARY CHECK POINT. 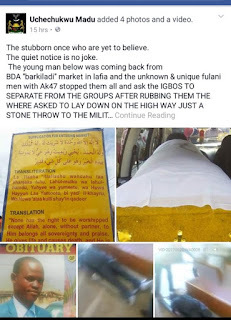 They have commence the killing already at LAFIA THE CAPITAL OF NASARAWA STATE.